In a previous article I explained How I Use Hashtags to Track My DNA Matches but that isn't the only way I track DNA in Legacy. I like to add my "cousin matches" to Legacy as unlinked individuals with the anticipation that I will be able to link them eventually. I don't add all of my matches which is in the thousands but rather I add the matches that are 50+ centiMorgans (to start with) which is at the 3rd cousin level. I like to keep all of my research in one place so it make sense for me to do it this way. I alluded to this in DNA Matches - Where's Their Tree? and I wanted to explain my method further. I had to make up screenshots because my real matches are of course living people. I have all of my matches as "invisible" in my file because this information is for research purposes only. I also have more information recorded on each match than this but this will give you an idea of what you can do. 4 - I have this person in triangulation groups with other matches that I organize using Hashtags (see How I Use Hashtags to Track My DNA Matches). A triangulation group is a group of people that you match but they also all match each other. It is a way to be sure that everyone is matching on the same chromosome (you have TWO of each chromosome, one from your father and one from your mother). 6 - These people are always invisible which means if I ever export my file in any way, reports, charts, gedcom, webpages etc., these people will not be included. I would have to manually override the privacy options which can't be done by accident. I hope this have given you some ideas of ways you can record your DNA in Legacy. If you have some additional tips you think our Legacy readers can use please post them in the comments. And notice on the next item you have "one from your father and one from your father)." 4 - I have this person in triangulation groups with other matches that I organize using Hashtags (see How I Use Hashtags to Track My DNA Matches). A triangulation group is a group of people that you match but they also all match each other. It is a way to be sure that everyone is matching on the same chromosome (you have TWO of each chromosome, one from your father and one from your father). Shouldn't the second father be mother? This is Intermediate. I was flip flopping back and forth between Beginner and Intermediate. 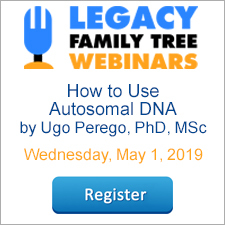 It is Beginner as far as a Legacy task but it is definitely a solid Intermediate in the DNA knowledge you need to have to be able to complete the Legacy task. Michelle. Thank you. Question, for item 3, are you saying you put it in sources? That seems like it is "hidden". I have to put a source so that I know where I got the information. 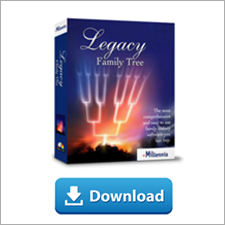 The "DNA Match - Lineage not confirmed" is only a temporary source. Normally I don't put unsourced information in my file but in this case I have to because I have to be able to see how everyone is related to everyone else when I am looking at DNA. Eventually I will come back and add real sources. I don't think the info is hidden. This is information that will never be exported in any fashion so it is there for me to know that I need to verify the familial links. For example, my uncle has two y/DNA 111 marker matches with a genetic distance of 1. This is INCREDIBLE! All three lines end in a brick wall in the 1700s and there is no obvious connection between the three lines (one ends in SC, one ends in TN, and one ends in VA). I had to input all three lines as given to me by the other two researchers. None of their information has been verified. One of the researchers is an EXCELLENT researcher so I am not too worried about that line. It is the 3rd line that is a problem. The two of us have been trying to contact the tester for over a year with no luck. We have no way to know what his sources are. He has his line back about a generation further than we do and to another state so it is VERY important to verify every relationship in his line and that is what the other researcher and I are doing now. I have all of those relationships marked with my generic source. As I confirm a relationship with real sources I take my generic source out and replace it with real sources and update the evidence accordingly. What I was wondering was why not put that in an event like the others you show so it is visible on the same screen and you can search and sort for it. Re: "my uncle has two y/DNA 111 marker matches with a genetic distance of 1. " I know you are using hashtags to track DNA info, but I have not tried that yet. With my yDNA Hashtags are even more important to me than using them for autosomal. Not only am I following the lines of the three DNA testers I am also following several unknown Simmons lines that were in the same area and the same time. My goal (hopefully) is to find Simmonses that ends up in more than one related Hashtag group. For example, there is a man named Ralph Simmons who had a passport from Jones County, GA to the Mississippi Territory. Ralph lived near my Simmons brick wall in Mississippi but he migrated from the county where one of my uncle's match's brick wall is! That is too much of a coincidence. So, we tracked down a direct descendant of Ralph's to DNA test (still waiting for the results). If Ralph matches then we might have our connection between two of the lines. Ralph is in the Jones County, GA Hashtag, Marion Co, MS Hashtag, and he is also on a Military Hashtag for serving in the same MS Militia unit as some known and unknown Simmons did. That is what I am looking for, overlap. Since there are also other unknown Simmons' in these Hashtag groups I will be able to start pulling them in as well. Having said that, this is just my method. You need to do whatever makes sense to you. The possibilities are unlimited. That is what I call a "Senior Moment" but I myself have the excuse of age: 81. I learned to type in High school way back in 1954-55, half year looking at blank keys on a Royal typewriter and a large pull down keyboard in front of room. Other half of year was driver education. Those were the days when education was paramount. You state that your cutoff for tracking potential matches is 50 cM. I'm curious as to which cM statistic you use. I'm looking at a MyHeritage match that lists the following... Shared DNA 1.1% (77.8 cM); Largest segment 18.5 cM. Normally I am looking at the total but 50 cM is not a hard and fast rule. I might see something less that looks like it has potential and I will follow it. I have enough matches above 50 to keep me busy for awhile :) I also do consider segment size. Let's say I have a match that is 70cM total but the largest segment is 7cM. That match will not be as urgent. One question: In your image, you have an event with "John has asked for his non identifying information." Would you please clarify what you mean by this statement? In most states adoption records are sealed. In some of those states the adoptee can request "non identifying information" on their birth parents. It give information about the two parents but doesn't give their names. You might find their age, ethnicity, physical appearance, extended family information etc. I posted a question about DNA tracking in Legacy to the Facebook group and you said there would a be Tuesday tip I have been waiting eagerly for it, you did not disappoint! Thank you for EVERYTHING you do to offer help and guidance to us users!